My house. Completed (as far as houses are ever ‘completed’) in September 2016. 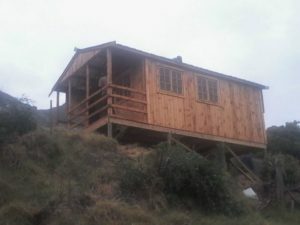 I’m proud of my house, but I don’t think it is the pinnacle of design, or even really an exercise in sustainable living. It’s just my house. But it is really, truly, MY house. 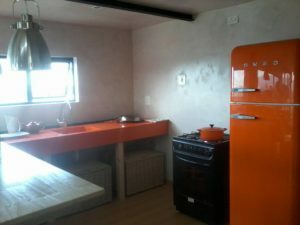 It has all the crazy quirks that I have – being designed around water, sporting orange touches and proudly featuring a dry toilet. Note: I speak of building my house. As if I did it myself. I certainly got my hands dirty, but this was a group effort – there were architects, building contractors, steel specialists, civil engineers, carpenters, bricklayers, informal labourers, electricians, plumbers involved. You name it, they were there. I was more involved than most owners who commission a house, but it certainly wasn’t me, on my own, who built this house. 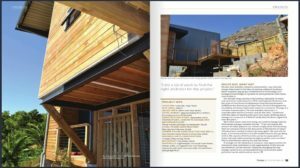 Timber Design, Issue 31, April/May 2017 – industry magazine for the timber design and construction industry. This was through my architect who is also an active volunteer for things that matter. And then, Garden and Home, May 2017. The least substantial of the lot (and they carefully edited out my naked lady! ), but the one that you can walk in and buy off the shelf in many shops all over South Africa, which gave me a special sort of thrill. I have no idea how that happened, but I am resolute to make this happen more (for AquaSavvy, and in a few years, when my garden is how I like it, revisting my house). This publicly available Facebook album shows the journey. 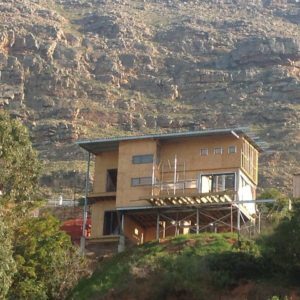 When I first committed to building a house from scratch I was sold on Wolf who built Tony’s hemp house in Kommetjie (I LOVE hemp. Hemp for the win). Wolf and I connected and shared a pleasant afternoon talking, he convinced me not to buy the original plot I had an eye on, for which I am eternally grateful. But as far as the architectural side went, we did not connect. Hopefully we do get to collaborate on a future project. So next was Sonja Petrus, another architect whose work I admire, and met in a supercharged women’s evening in one of her projects, the Weaver’s nest. Again, while we connected as women, the spark to collaborate on this project was not there. This left me stuck. 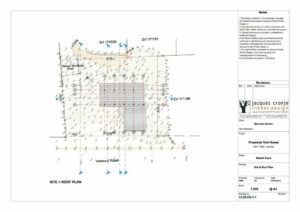 While I figured out what my next step was, I just randomly shot off emails to get a per-square-meter cost estimate of timber homes to get an idea what I’m dealing with. Not finding a connection with my two favourite architects knocked my confidence and I was trying to psych up for going it alone. 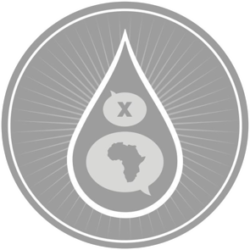 One of my emails landed in Jacques‘s inbox, and he replied kindly, “pay me for an hour to look at the site, and let’s take it from there”, which I was happy to do. At this point any advice was welcome. He came, quietly, unassuming. His silence flustered me a bit so I stood on site blabbering on, hands waving, for an hour about my dreams and wishes and what the sun does and stuff. He only sometimes piped up for a clarification, scribbling away the rest of the time in his notebook, to my slight consternation. At the end of the hour, when I exhausted myself and fell quiet, he turned to me, showing me his notebook and asked, how’s this? My jaw dropped. That was it! That was my house! After that it was a done deal; I trusted him completely. We did have constructive to-and-fros consisting of me offering crazy ideas and he and Andre explaining gently why that won’t work, but mostly we found creative compromises. For the most part though, they were free to do as they pleased. I think it is important to trust people to do their job. Yes, be involved, be super-engaged. But trust them, too. It’s designed with the site in mind. We didn’t excavate anything. 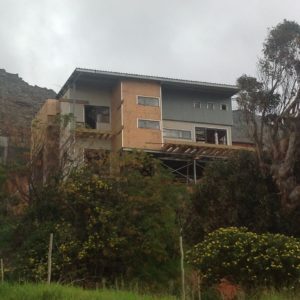 We stayed true to all building requirements, didn’t need any departures, didn’t violate height restrictions. It’s designed in an L shape to protect against the South Easter summer wind. It has a thick rammed earth wall on the Western side to protect from the cold in winter. 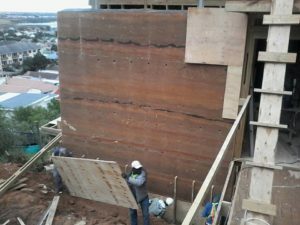 The rammed earth wall is a highlight all on its own. Perhaps if I had to build the house on this site from scratch, just maybe this whole thing would be rammed earth. 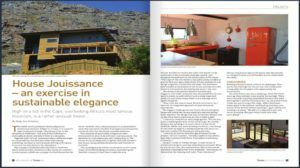 But as it stands, I like the mestizo of having brick and steel and wood and rammed earth, the masculine or brick and rock (rammed earth), the floating feminine of wood (this is how I think of it). The slim, elevating clean lines of steel. I chose the steep slope to be able to work with gravity, I’m still figuring out why I had that plan. During the drought I decided to build dams, which I guess could best be described as ‘leidamme’ – dams for irrigation, that takes stormwater from the road above my house. The rainwater feeds my duck pond, but the house is so small that my roof isn’t a very good catchment strategy. The gracious amount of natural light, and the way the house regulates its temperature has become a non-negotiable. It’s spoilt me to not tolerate anything less, for work or play. A personal highlight is to have been able to live on site before and during (and obviously, after) construction. 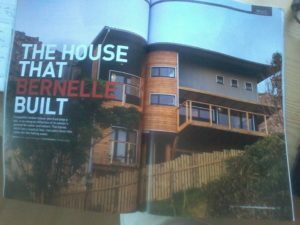 The back story to this is that I was terribly naive and thought the house will be built and done with in three months, when it actually took two years just to work its way through council (without departures!) and another year to build. 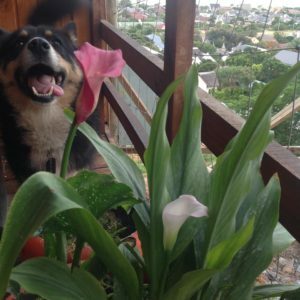 I also had such an incredibly tight budget, and dogs to take care of. 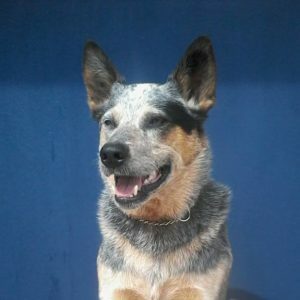 If I rented a place that could also take dogs, or simply took them to kennels, it would have bankrupted me (of course, at the time I just saw the expected three months as an avoidable expense). So, seeing as I owned the land I bought a wendy house and fenced a third of the plot and that was that (thinking, this will be over soon anyway). 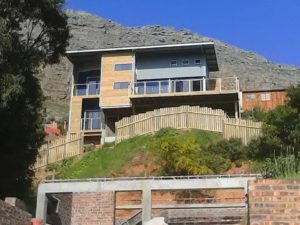 Half the neighbours thought it was quaint and awesome and shared their similar dreams (for holiday homes, not, like, in Cape Town suburbia) with me. The other half lost their minds. It was hilarious. Moved in 25 January 2014. Moved out 8 September 2016. Anyways. It was great to live on site because I got to know what the best bits are and what to work around, what to plan for, where the rain comes from, what quirks happen, that we really really need to plan for subsurface water – when Julie built her house two plots down, they found a spring and we don’t want problems with damp. Sadly, and ironically, when it came to digging my foundations, we learnt that the damn spring stopped a few meters short of my property (we prepared sub-soil drains for in case, anyway). Hence another dream of community level irrigation and garden plots was born – watch this space. Once building started, I could give input on a million little details that the builders didn’t think relevant but was really important to me. I also learnt so much about building, and gained immense confidence to do things that I previously considered ‘man work’ (Yes, we need to free ourselves from our own minds). It was great to have rapport with the builders, but that also meant that their inevitable squabbles affected me deeply too. On the other hand, the big questions about priviledge and race and class kept me very busy too. There’s no easy answers, I found this part of the journey heartbreaking. A fond quote from the informal labourers who have been helping me with the endless little things that need doing at the end of the formal contract: “Sometimes you want to do something and we think, hey this woman is mad, but in the end it is really good.” I love that I have people who trust me, and who is fine with me jumping in and working with them, who I can ask stupid questions, and who challenges some of my orders because it doesn’t make sense. Before this house I had to do everything alone, because I couldn’t trust that I would get what I need if I gave the job to anyone else. It’s a huge time investment, sure, but it’s worth it, and it gets easier, and I like to believe the benefits are mutual. Surveying the site was special, not least because Kobus Coetzee is a friend from orienteering, and it’s special to be able to value someone professionally after they have been so valued as a person for so long (council also says he’s excellent). 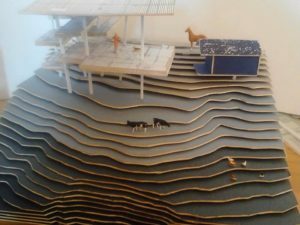 This may also have been my first ping into geodesign, from his site profile I built a papercraft model, and contour lines have had so much more meaning since then. The morning the site container was delivered, I was still sleeping. 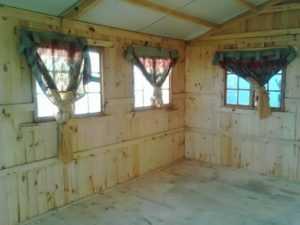 I thought someone was demolishing my shack – with me inside! That was a brusque notice for this little academic that I was going to have to get up earlier to interface with the real life. 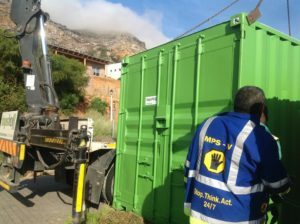 Woke up to the sound of my shack possibly being demolished from the side – the container arrived. I am peeking around the corner of the shack in my pajamas. The garage floor – the only bit of conventional brick and cement building, and the first thing to emerge – felt so significant. 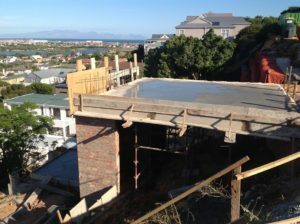 The cement had to cure/rest over the builders holidays. It was all just so fitting. 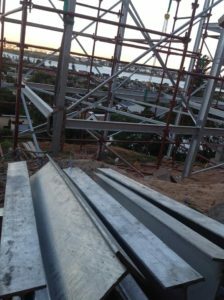 The steel frame going up in one day. Seeing the outline of your house just like that! and then realising the whole thing is one meter too high. Seeing how people skilled in their trade ratchet the entire thing up, cut one meter off, set it down into place and weld it back again, was awe-inspiring. 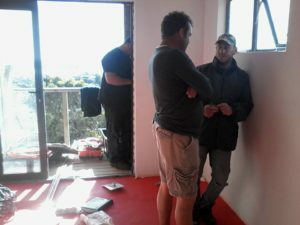 One of the bad bits I forgot – organising an international conference while building a house, and then the site container was burgled! 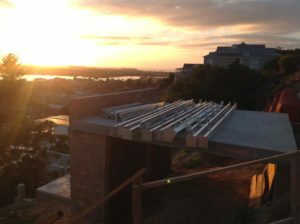 The day the formwork came down from the rammed earth wall. Seeing set-in-the-die carpenters who scoffed at this earth building rubbish drop their jaws and stand speechless at that wall, that was something. A bitter sweet time was saying goodbye to the shack. It was during another hectic work bout, so on a Thursday night moving out until I collapsed in a heap, waking up early and asking Clive to help me move the mattress, going to work and coming back to find the shack… gone. I think it is quite foreseeable that I will end up living in a ultra small space again at some point. Another emotional moment, was, quirkily, moving my furniture. 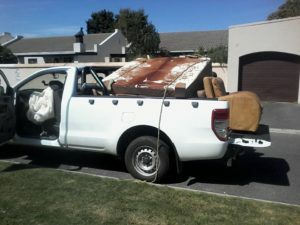 My only ‘proper’ furniture consisted of three pieces, all leather: a three-seater, a huge custom nguni-skin ottoman and a by now two decade old reading chair, and with my vagabond life (I romanticise), they have not had the best treatment. More so, they were stored at a friends house and had become strangers to me. When they were ready to move back in, they were collected from the friend’s house, treated to a make-over, to be conveniently delivered to the new house (sneaky). This make-over-reunion was significant to me. 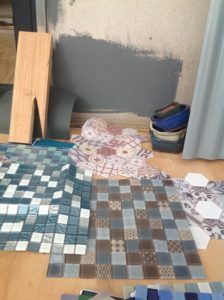 Designing the bathroom, what a hoot! Nothing looks like it does in a conventional bathroom, and it had the guys scratching their heads. I am very pleased with the result, but I would like to put more effort into the floor. It needs more shine, more … uhm … Muslim / Arabic/ Eastern/ mosaic influence. Tiles. But not sommer any old tiles. More drama. 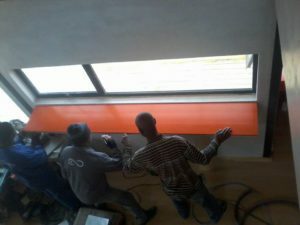 Of course, my orange kitchen counters. Yes. Looking over the whole thing and comparing it with two other building sites in my street, I have to exclaim again how professional my people were. On time, do it right first time, stick to schedule, take my questions and requests seriously. Well done. I did not have the dreaded building-a-house-is-horrible experience. I’d gladly do it again. Only smaller. Tongue-in-cheek: choosing colours. I like bold colours, but this house was so well designed, so spacious, so sleek, that to add colours felt insulting. Even though I hate white, most of the house is white (well, a speckled egg northern province mined (gasp, so unsustainable) rhino-crete white) – we did the undercoat and then sealed it without adding a top coloured coat. I haven’t even hung my prints, it feels disrespectful. 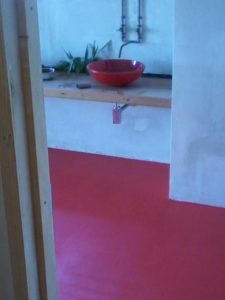 Yes, the kitchen is pantone orange and the bathroom is red. And after weeks of agonising the few coloured outside bits is a naval-ish blue-violet. So there’s that. I don’t like my floors. A current thinking challenge is how to do something I like that is feasible for a rough and tumble working environment, acceptable for potential resale, affordable, and pleasing. Corcoleum ticks all the boxes except for ‘affordable’. My brief was a small house, a tiny house, a minimalist house. 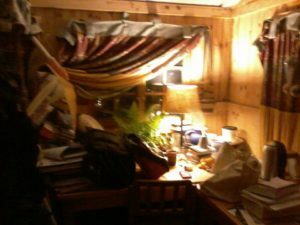 I spent two years in a wendy hut, 15.2 square meters in size (approximately a bit shorter than a single garage), and it was good. Yes, my car stood outside, battered by vandals and the weather, and yes my dogs kept kicking over my experiments, and yes, Fiona, my collie/husky cross refused to sleep inside such a cramped space, but it was good. Early stage design had that typical ‘I want it small but also this and this and this and that’. 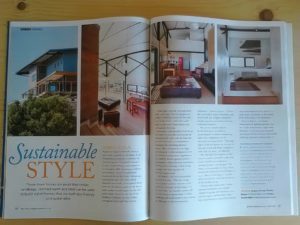 I have trouble reconciling my desire for small, a light footprint and all that, with my creativity, my bubbling-over half-done projects and a finger in every pie. It ended up being 89m2 floor space (about 960 sq ft). Another challenge is that this house is far too fancy for me. It smacked head-on into my confidence issues. Partly this was my fault – who buys such a challenging plot, in such a prominent position, and expects to stay hidden? 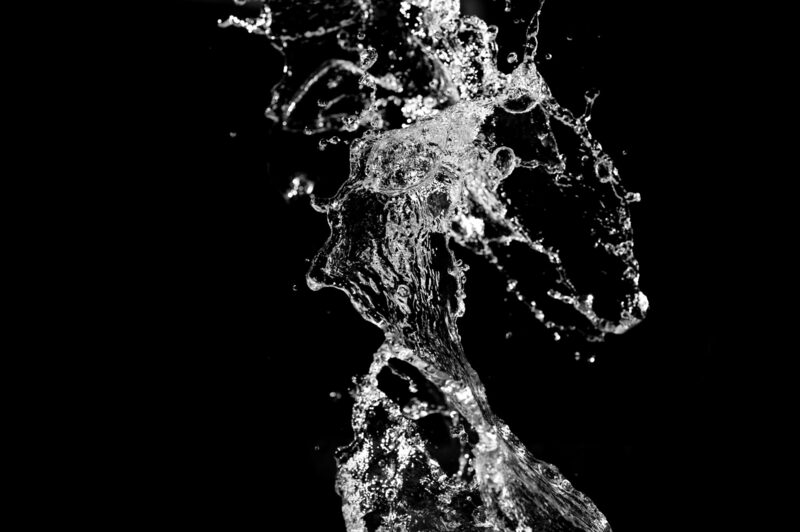 But partly it was the discovery that forced me to acknowledge people’s hunger for my differentness. 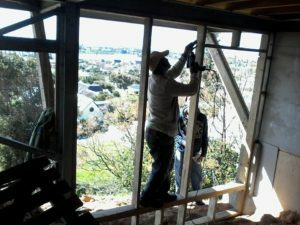 I had people visit the house, asking to take a look inside, asking about progress. 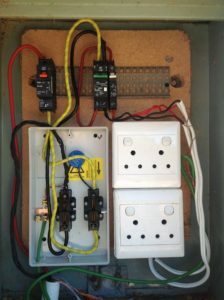 Once it was done, I had – I am not exaggerating – people shout over my boundary wall (I don’t have a doorbell to avoid social encounters) to be let in and showed around. Of course I couldn’t refuse, I have been privileged enough to stay illegally for three years due to the kindness of my neighbours. And I have been privileged to study, explore, research, play so far to know so much, and been so privileged – nay, blessed – to have a mother who supported me when my measly budget was ripped to pieces, to finish the house (when she heard of my plan to ‘build in stages’ and live in a rough structure, she put her foot down). So I had to swallow my insecurities and pay it forward. I had to acknowledge that yes I can create beautiful things, that I matter. This is hard. A work in progress. Speaking of work in progress, I struggle with how complete things are now. Over time I’ve come to realise I am most at home being a creator. Not a maintainer, or a finisher. I like work in progress, (when I myself am not the work in progress, of course). So I will always be restless, in this house, anywhere. I will always have a dozen half-done projects.